In his speech on Tuesday, Israeli Prime Minister Benjamin Netanyahu said much of what one might have expected at the annual conference of the American Israel Public Affairs Committee. But what was most telling was the one word he didn’t utter: occupation. It wasn’t just Netanyahu who steered clear of the word. So too did U.S. Secretary of State John Kerry in his comments the night before. It is this act of repeated omission that adds so much confusion to the simple question of what concerned Americans must do to advance human rights in the region. As a major supplier of arms and military aid to Israel, the U.S. government is not just a convener of “peace talks” and negotiations. It is also a major investor in the status quo, a state of affairs in which millions of Palestinian civilians face the risk of brutal violence from Israeli security forces simply for peacefully exercising their human rights. It is time for a real peace process that addresses American military complicity in Israel's human rights violations in the occupied West Bank. That’s why the U.S. government must stop providing weapons, ammunition, military equipment and training to Israel until Israeli security forces stop violating Palestinian human rights and are held accountable for past violations. Ultimately, the U.N. Security Council should impose an international arms embargo on Israel, Hamas, and Palestinian armed groups in Gaza. But that shouldn’t stop the U.S. from suspending military support to Israel now. The human rights violations and abuses perpetrated by Hamas or armed Palestinian groups do not justify Israel’s violations in the West Bank, including East Jerusalem. For those living under Israeli military occupation in the Palestinian West Bank, there is a two-track system of law for two different populations. The hundreds of thousands of Israeli Jews who reside in illegal West Bank settlements live under Israeli civil law with the protection of Israeli security forces. Palestinians, however, live under a separate system of Israeli military law that eviscerates their human rights to freedom of expression and association. This military rule is enforced – sometimes lethally – by the very Israeli security forces which protect those illegal Jewish settlers. Perhaps the best example of this is Israeli Military Order 101, which prohibits all gatherings of 10 or more people “for a political purpose or for a matter that could be interpreted as political” or even “to discuss such a topic.” Any such gathering is illegal without the permission of the Israeli military commander in the area. Israeli soldiers and police in the West Bank use everything from live ammunition to tear gas to violently crack down on Palestinians engaged in largely peaceful acts of protest (Photo Credit: Private). When Palestinians inevitably violate Order 101 or other similar rules, they risk a violent response from Israeli soldiers and police. In our latest report, “Trigger Happy: Israel’s Use of Excessive Force in the West Bank,” Amnesty International details just how Israeli soldiers and police in the West Bank use everything from live ammunition to tear gas to violently crack down on Palestinians engaged in largely peaceful acts of protest. According to the U.N., Israeli forces killed more West Bank Palestinians in 2013 than the combined totals for 2011 and 2012. Forty-five were killed in the past three years. During the same period, at least 261 Palestinians in the West Bank, including 67 children, were seriously injured by live ammunition fired by Israeli forces. Since January 2011, over 8,000 Palestinians in the West Bank, including 1,500 children, have been wounded by other means. These include rubber-coated metal bullets and the reckless use of tear gas. 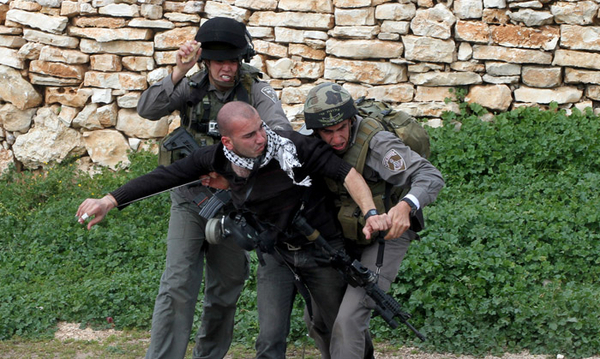 Some Palestinians in the West Bank do throw rocks at Israeli security forces enforcing the occupation. However, such acts generally do not pose a serious risk to Israeli security forces, given soldiers’ distance from protesters and the heavily protected nature of their positions. The Israeli army’s penchant for responding to rocks with lethal violence flies in the face of international law. Against this backdrop of violence by the military, Israel reportedly doubled the construction of Jewish-only settlements in the West Bank between 2012 and 2013. 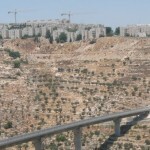 This settlement construction frequently involves the forcible confiscation of Palestinian farmland, villages, and roads, which often involves even more violence against Palestinian protesters. All of this brings us back to the original sin – leaving the word occupation out of the public conversation. The fact of the matter is that Israel maintains complete control over 60 percent of the West Bank. Meanwhile, the Palestinian Authority has limited jurisdiction in some 230 separate enclaves that are each surrounded by other areas under full Israeli military administration. Instead of obscuring this reality, President Barack Obama and Secretary of State John Kerry must be transparent in their language. Not only that, but the role of U.S. military aid in subsidizing Israeli human rights violations must also be acknowledged. The human rights abuses perpetrated by Hamas or Hezbollah are no justification for Israel’s violations in the West Bank. And as the largest outside source of arms to Israel, the Obama Administration must acknowledge this. It is time for a real “peace process” that addresses American military complicity in Israel’s human rights violations in the occupied West Bank. This entry was posted in Children's Rights, International Justice, Middle East and North Africa, Military, Police and Arms, United Nations, USA and tagged abuses by armed groups, Children's Rights, communities at risk, economic social and cultural rights, international justice, Israel and Occupied Palestinian Territories, Middle East and North Africa, Military Police and Arms, Palestinian authorities, right to organize, rights for victims of armed groups, United Nations, USA by Sunjeev Bery. Bookmark the permalink. The problem you fail to mention is that when Palestinian Arabs discuss "the occupration", they are not referring to the West Bank and Gaza, they are referring to all of Israel. I am sympathetic to the plight of prisoners of conscience (the original AI mission), as well as to the suffering of all oppressed people. If Palestinian Arabs were led by a Gandhi or Mandela or King, they would receive broad support from the United States and Israel and would already be living in peace in a free state. Unfortunately, Palestinian Arabs have long served as pawns for the surrounding Arab and Persian theocracies and dictatorships who have a vested interest in their continued statelessness and suffering. Those theocrats and dictators have, for decades, funded, armed, and controlled extremist groups with an agenda of hatred and conquest instead of peace. The stated goal of Hamas is to kill all Jews and the slightly less militant PA continues to indoctrinate their children with antisemitic race-hatred. Having recently experienced attempted genocide, Jews are understandably reluctant to empower folks dedicated to killing them. As a result, the Israeli hawks and religious right have risen to power and sadly they too have a vested interest in continued conflict. I'm deeply disappointed with AI's decision to continue to fan the flames of hate rather than advocate for peace. No amount of political or economic pressure will cause the Jews to take actions they consider suicidal; building trust and empowering leaders who are truly interested in peace is the only rational path to ending the suffering of the Palestinian Arabs. I hope you will reconsider. get snapchat hack tool and start hacking snapchat accounts online.